The example uses weather data provided by http://www.openweathermap.org. The key part of this example is the application's data model, contained in the WeatherData and AppModel classes. WeatherData represents the weather information taken from the HTTP service. It is a simple data class, but we give it Q_PROPERTies to expose it nicely to QML, later. AppModel models the state of the entire application. At startup, the application first begins by waiting for network connectivity. We do this using the QNetworkConfigurationManager and QNetworkSession family of C++ APIs. If no default source is available, we take a static position and fetch weather for that. If, however, we do have a position source, we connect its positionUpdated() signal to a slot on the AppModel and call startUpdates(), which begins regular updates of device position. When a position update is received, we use the longitude and latitude of the returned coordinate to retrieve the current "city" name for use in the weather lookup. To inform the UI about this process, the cityChanged() signal is emitted when a new city is used, and the weatherChanged() signal whenever a weather update occurs. 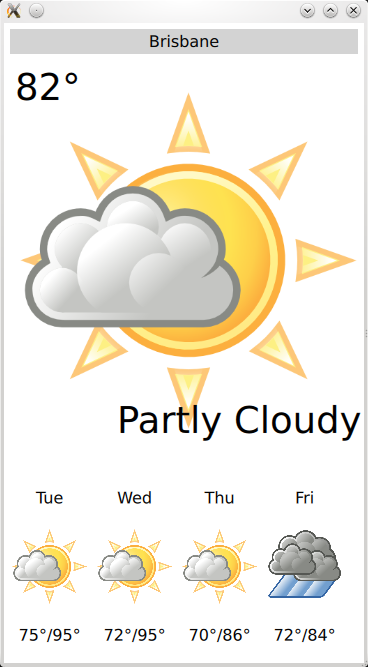 We use a QQmlListProperty for the weather forecast information, which contains the next 4 days of forecast weather. This makes it easy to access from QML. To expose these to the QML UI layer, we use the qmlRegisterType() function. We call this once for each type we wish to register, before loading the actual QML file. Finally, in the actual QML, we instantiate the AppModel.